In The Wicked + The Divine #25, structure is the name of the game. 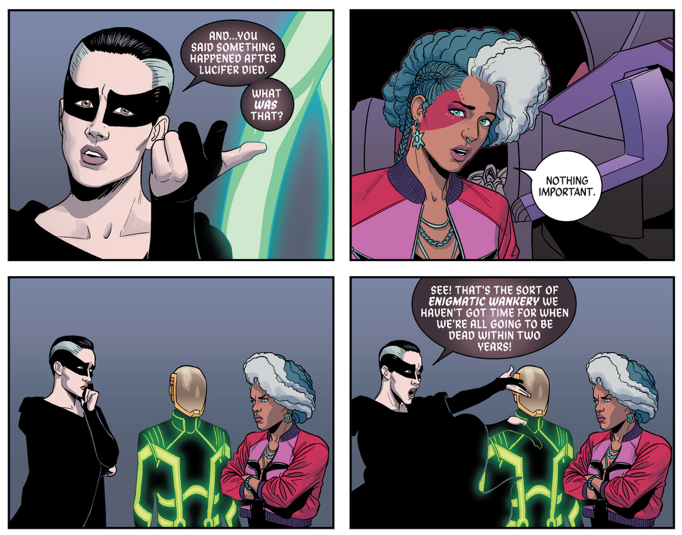 The majority of the issue is a conversation between Persephone, Urdr, and Woden, as they set out the rules for their shaky alliance in the brand new post-Ananke world. This has the potential to be dangerous: comics are a marriage between art and text, and if one overpowers the other, you end up with a disjointed finished product. 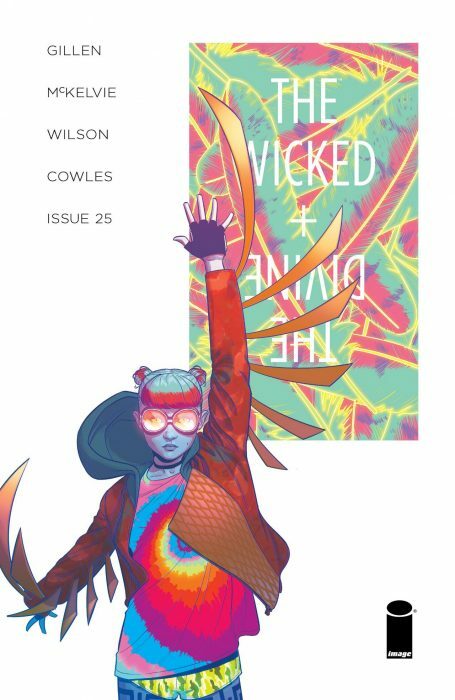 Thankfully, writer Kieron Gillen and artist Jamie McKelvie deftly navigate that balance by playing with the structure of a comic to balance text with silence. Structure further gets played with in the issue’s highlight: four pages of darkness, as Woden tumbles through the blackness of the Underground, Persephone’s words echoing through his head. The highlight of the issue is a two-page spread that’s almost ENTIRELY blackness, with a small figure of Woden in the corner as the only “art” on the page. This does a wonderful job putting Woden and the Underground in context, showing just how small and pathetic Woden really is in the darkness of Persephone’s Underground. Once again, Matt Wilson’s colors are amazing. I’ll refrain from pointing this out every issue, but forgive this one indulgence. The shades of darkness in the Underground scenes are particularly lush and astonishing. Here’s my question, though: I don’t know how long this will last. We’ve only met one ex-Valkyrie before, Kerry/Brunhilde back in issue #7. Despite being invited to a convention panel seemingly solely to gossip about Woden, she’s willing to do anything to gain her pseudo-godhood back, whether submitting to Woden or attempting to kill him. “I want what you have” was a recurring phrase throughout the first two arcs and for the Valkyries, Woden is the only way to get that. Granted, there’s no inclination that Woden will take away the Valkyrie’s tech the way he took away Kerry’s, but this is seemingly too neat a bow on a more thorny issue. In the big final page reveal, Minerva is (once again) reduced to damsel in distress. 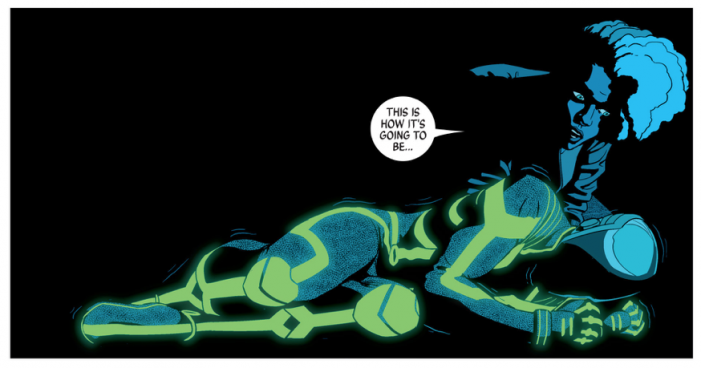 I worry a bit that Gillen & McKelvie don’t know what to do with her. Her biggest narrative role so far has been “cute kid in trouble,” and I’d like to see them push past that. Baal using his lightning to make toast is easily the best part of the issue. It’s such a charming, small little detail, especially when Persephone and Minerva call him out on it moments later. I waffled back and forth on including a long piece about while I’m glad the Valkyries have been “released from their contract,” I wish that Gillen went further and had Woden challenge Urdr on the role of Verdandi and Skuld. Pointing out this thorny narrative problem (there’s no sign that Verdandi and Skuld wanted their pseudo-god status to begin with) would be a wonderful crinkle to Urdr’s character. Plus, co-opting the language of consent is totally a dirtbag Woden thing to do. Previous ArticleTV Review: Taboo Series Premiere - "Shovels & Keys"